Players for a Chaos Pact team; Troll, Dark elf and a Moosotaur. The troll is from Greebo, the dark elf (not sure) and the Moosotaur is from Eurobowl 2016. The moose is sculpted by the Kalle (Gimpen) who also has made the beautiful Ogre team available from Impact. He has done a lot of other stuff, super punch troll and some goblins. The dwarves I do hope get some wider spread some day, we´ll see. The team that they are joining are wearing purple and are generally darker. Thats what I went for. Mostly glazing and washing apart from the metal parts. Quite fun. Looking forward to painting my own moosotaurs soon. Really happy with how the horns turned out. 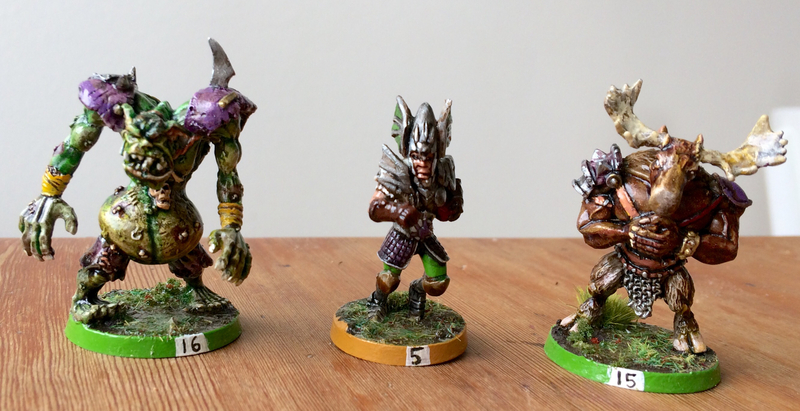 Next up are gobbos, completing an Orc team. 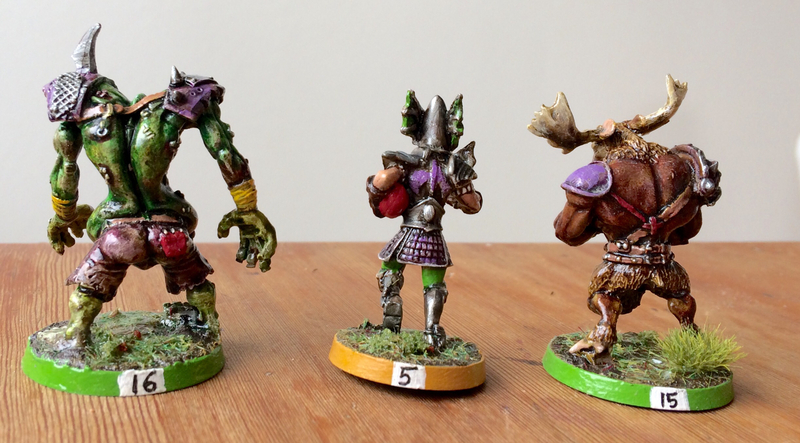 The first three from left are John pickfords sculpts, from wargames foundry/Warmonger miniatures. The last one is greenstuffed. The NAF trophy was won in febuary, not by me but by the team that the goblins are completing the savage orc themed team I painted earlier.